Jane Griswold Radocchia: "beautiful variety of light and shade"
"beautiful variety of light and shade"
Asher Benjamin wrote for carpenters. He starts The American Builder's Companion with ten plates of basic knowledge a 'joiner' would have needed in the early 1800's, including how to divide a circle, how to layout mouldings. Many readers seem to skip this technical part of his books, seeing it as archaic. Sometimes historians are interested in how Georgian architecture changed from using mouldings based on the circle (Roman) to those based on the ellipse (Greek). So they note the plates and move on. They miss the man who knows how light creates. He cares about what he is seeing so passionately that he figures out how to write about it so he can share it with his readers. I know first hand that it's not easy to put what an architect sees into words that someone else can understand!
" In the Roman ovolo there is no turning inward, at the top: therefore, when the sun shines on its surface, it will not be so bright, on its upper edge, as the Grecian ovolo; nor will it cause so beautiful a line of distinction from the other moldings, with which it is combined, when it is in shadow, and when lighted by reflection. ...the Grecian, or quirk ovolo, ... if it is entirely in shadow, but receive a reflected light, the bending, or turning inward, at the top, will cause it to contain a greater quantity of shade in that place, but softened downward around the moulding to the under edge." As I read his text, I met the man himself. The quotes are from Plate IX, Names of Mouldings, American Builder's Companion, 1810. 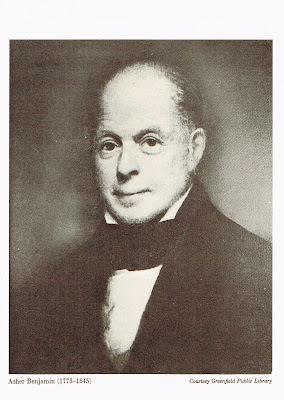 This portrait is from the Dover Publications reprint, 1969, of The American Builder's Companion, Asher Benjamin, 6th edition, 1827. The Public Library in Greenfield was designed by Benjamin. I have seen the original portrait at Historic Deerfield, Deerfield, MA, where Benjamin built a school.